The global superstar duo, The Chainsmokers, wrapped-up the X Games events on Saturday and they did not disappoint. This wasn’t the first time The Chainsmokers set foot on Buttermilk Mountain for this extreme sports event. After a two-year hiatus from the venue to tour internationally and release their album Sick Boy, the duo returned as the first group to perform twice at the X Games. In 2018, The Chainsmokers were declared the second highest paid DJs in the world by Forbes magazine. Unlike many artists, the group makes music while on tour, so they’re always ready to debut new music. The song Closer, with was developed on tour with Louis the Child, launched them into stardom by breaking Avicii’s previously held record of the No. 1 song on the Billboard’s Hot Dance/Electronic Songs chart by spending 27 consecutive weeks at the top. The duo went on to simultaneously match another record formerly set by The Beatles and the Bee Gees in 1958 by having three hits on the Billboard’s Top 10 Hot 100 at the same time. Alongside Closer, Paris and Something Just Like This, which featured vocals from Coldplay’s Chris Martin, earned the band this record. Opening their set with Sick Boy, a single they debuted last January, set an aggressive tone for the rest of the set. The next couple of songs were Don’t Let Me Down, Paris and an acapella version of Closer. From the moment he grabbed the microphone, Taggart was animated. Between jumping up and down, off the stage platform and running from one side to the other to get the crowd’s energy up, he would play the guitar or his soundboard while giving the crowd directions as to when to clap their hands or sway from side to side. Using a frivolous amount pyrotechnics, multi-colored lasers, a copious amount of smoke, golden fireworks and bass that made it feel like you were in the middle of an earthquake, The Chainsmokers made you forget about the 17-degree temperature and give your undivided attention to what was happening on the stage. Choosing to remix Go Girl by Pitbull, I Fall Apart by Post Malone, Numb by Linkin Park, Every time We Touch by Cascada and Circle of Life by Carmen Twillie and Lebo M. from the Lion King, the Chainsmokers exhibited their talents to remake almost any kind of song from any genre and turn it into a club banger. Performing a few new tracks, such as Beach House, This Feeling and Siren, they were able to deliver a diverse musical performance, even if not all of the fans knew all of the words yet. The beginning of the set was livelier than the ending, but the entire performance still managed to stay enticing because there was always something wild happening on stage. Whether it was a drum solo or some amazing visuals or just being in awe by the technicality with which the show was put together, the performance was one for the ages. As the final song for the performance, The Chainsmokers played Closer one last time before saying adieu to the fans that stuck out the bone-chilling weather to watch them perform. 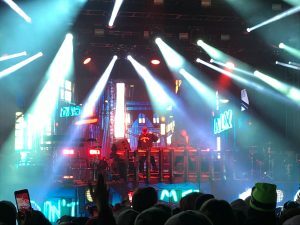 The Chainsmokers had the standout show of the X Games, although this may have been a benefit of performing at night and being able to take full advantage of the dark skies. The crowd singing their hearts out to the final song was evidence the duo had, in fact, brought the house down with their set.